The Cambridge Analytica scandal revealed how personal data is being mistreated. But used responsibly, this information could be hugely beneficial for developing our cities, says Eleanor Jolliffe. For years we have unwittingly been giving away reams of personal data to private companies without considering the broader consequences. Facebook's Cambridge Analytica scandal, fake news, and various global elections in recent years have begun to wake the world up to the uncomfortable reality that this data may be being used to influence our opinions and tastes for commercial and political gain. Collection and use of personal data is an ethical minefield that has not always been well navigated, but used responsibly this data could be a vital tool in designing and running our cities more effectively. 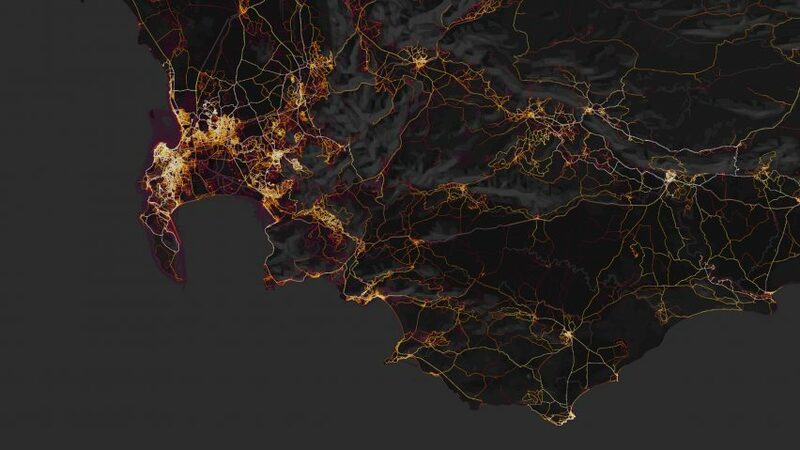 One of the most fascinating of the few public releases of spatially aggregated personal data is Strava's heat map, a glowing testament to the planet's legions of amateur and professional athletes. Routes around the world heat up as they are followed by app users with the most popular routes showing white hot. While the map has been controversial for accidentally uncovering the layout of secret military bases, it is a potentially invaluable tool in the urban planner's or masterplanner's arsenal – giving a unique insight into the use of pedestrian routes around the world. The data is limited to users of the app but, even with this allowed for, it provides a fascinating snapshot of the world through the eyes of its physically active citizens. Perhaps more immediately impactful – if perhaps more controversial – is Cape Town's water map. Over the summer of 2017/18, Cape Town underwent a severe drought during which its main reservoir fell below 11 per cent of its capacity. A daily water restriction was put in place to prevent the city running out of water before the wet season arrived. Day zero, when the city would have switched off residential supplies and installed stand pipes in the streets, was narrowly averted, and now the winter rains are replenishing reservoirs. Water usage restrictions remain in place however and the city believes it will take four years of winter rains to fully replenish water levels. The City of Cape Town municipal billing system uses the data it holds from household meter readings to publish a monthly map showing the water usage of each individual address in the city. This allows households to see how they sit against their targets, but crucially allows them to see how their neighbours are faring. The City hopes the map will motivate households struggling or unaware of their high usage to stay within the water limit. However, it caused significant local controversy, and worries that it would inspire vigilante action against addresses appearing not to remain within the limit. However, day zero has now been pushed to 2019 through the water saving efforts of the city's occupants, suggesting that the map may have served its purpose. No one looking at Strava's heat map or Cape Town's water map could argue that they are examples of data visualisation at their best, but both, when aggregated with other tools for urban exploration and understanding, build up an invaluable picture of cities from an angle and with a depth that would otherwise be unobtainable. Facebook, Google, Uber, Air BnB and Deliveroo, to name but a few, rely on collection of user data to fund their sites through targeted advertising, but also to better understand their customers and how to improve their services. The tech giants are not alone in mining our data however, with supermarket loyalty cards, credit cards and even the access fobs used on offices and university campuses logging and storing data about customer habits or user movements. This may sound somewhat Orwellian, but this data is mostly collected for as mundane yet essential a reason as a fire evacuations register, or to calculate working hours. It would be naive to believe that personal data collection is not here to stay, and I believe that the open sourcing of this data (properly aggregated and anonymised) is a gift that big tech companies could make to the communities they operate in. A gift of this nature would certainly align their actions to the mission statements so many of them hold to "give people the power…" or "don't be evil". Data that is already open sourced – both historic and recent – is already being used to great effect in understanding and improving access to cities and their services. The Anti-Eviction Mapping Project is an interesting example of this. Using mapping and oral history, this group of volunteers have been seeking to better understand the narratives around zoning and housing justice in parts of San Francisco reaching back into the 1990s. This work is being used not only to build a broader understanding of housing justice issue in the area but to create tools to empower local residents. Gather is another – though more global – example. This small non-profit has been gathering and mapping data about access to sanitation in the developing world to identify gaps and suggest adoptable changes in emerging cities. Recently their work has involved data gathering in Kenya, and creating a data standard for sanitation that would allow non-profits and commercial organisations to partner and build a better picture of global sanitation problems. They are realising, as we all are, that some of the data held by private companies, often considered commercially useless, could change the way we see the world, providing breakthroughs for governmental and social justice campaigns. In a rapidly urbanising world, the way we plan, run and improve cities has a significant impact on human wellbeing and quality of life. With the ubiquity of smartphones and the internet there are vast banks of data being gathered about the way we live, where we move and how we spend our time and money. While the thought of this much information being held by private companies can sound unsettling, this data has the potential to make the lives we live significantly better. Responsibly used and properly anonymised the possibilities to improve lives and cities hidden in this data are almost literally endless! It could inform planners of which public spaces and routes are best used – informing future city growth; real time information could be sent to city authorities so that maintenance resources could be targeted to the most used streets, police patrols re-routed or mass transport timetables adapted and governmental policy and infrastructure decisions could be informed with accurate and more comprehensive data about how cities are being used, and where needs are greatest. After the Facebook Cambridge Analytica scandal, social media filled with people announcing their intention to delete their accounts. However, the answer to the challenges surrounding data collection is not to bury our heads in the proverbial sand, or run screaming back to the pre-internet days. The balance between Big Brother and an efficient and helpful use of data is a delicate one. As personal data use becomes increasingly commonplace no doubt there will be instances where this balance is tipped too far one way or another. In the long run, however, aggregated personal data will be essential in improving our cities and the lives we live in them. Eleanor is an architect and freelance writer based in London. She has a regular column in UK architecture title Building Design, and has been published in the Architects' Journal, Architectural Review and the Saturated Space research group at the Architectural Association.